The #1 fighting game franchise in the world upholds its commitment to providing gamers with the definitive simulation of live WWE programming with WWE SmackDown vs. Raw 2009. Featuring added depth and realism, along with a first-ever co-op storyline, WWE SmackDown vs. 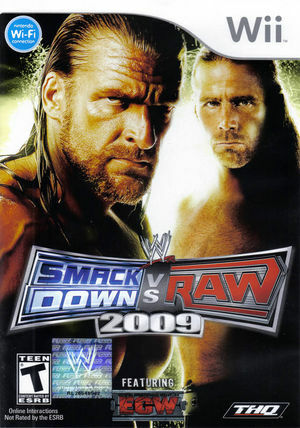 Raw 2009 enables players to come together and experience the virtual world of the WWE. On your own, you're great, but together, you're unstoppable. The graph below charts the compatibility with WWE SmackDown vs. Raw 2009 since Dolphin's 2.0 release, listing revisions only where a compatibility change occurred. This page was last edited on 16 January 2018, at 08:35.